Make reciprocal arrangements with friends or family to foster each other’s pets in case of emergency. 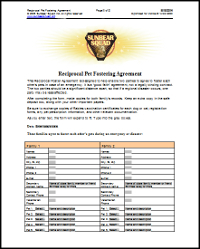 Download the free Sunbear Squad form to structure the arrangement. You’ll rest easier knowing that your plans can prevent your pets from becoming homeless if a tornado, flood, hurricane, or other extreme event should happen. Do you have a trusted friend or family member who shares a home with companion animals and lives a 30-mile distance away? Agree in advance to foster each other’s pets should one of you suddenly lose a home due to fire, flood, tornado, etc., to avoid surrendering pets to a pound or shelter during the emergency. Sunbear Squad’s free form makes it simple. You will find the link here (upper right hand corner) on our “Disaster Plans for Pets” page. This Reciprocal Foster Agreement is designed to help enable two parties to agree to foster each other’s pets in case of an emergency. It is a “good faith” agreement, not a legally binding contract. The two parties should be a significant distance apart, so that if a regional disaster occurs, one party may be less affected. After completing the form, make copies for both family’s records. Keep an extra copy in the safe deposit box, along with your other important papers. Be sure to exchange copies of Rabies vaccination certificates for each dog or cat, registration forms, any pet prescription information and other relevant documentation. As you enter text, the form will expand to fit. Type into the gray boxes. Please take this simple step to bring peace of mind now and lifesaving shelter for your pets if ever the unthinkable should happen.